This is a wonderful collection of 3 Christmas Tree Printables! I’ve gathered up 3 of my favorite Christmas Tree Printable Art Botanicals to share with you today. These are various different species of Pines and Firs but all would be lovely to use in your Christmas Projects. I can just see these beautiful green branches decorated with some glitter, Christmas Balls or maybe some Snow effects. They would be wonderful with a few birds on the top or perhaps some presents underneath. I’m sure you will find all kinds of creative ways to use these in your Holiday Craft Projects or Designs. Most of these Vintage Botanicals are quite old … 2 are Circa 1870’s and I’m not sure of the exact age of the Giant Tree in the center, but it’s definitely an Antique and is quite old as well. All of these are prints that were scanned from my collection. 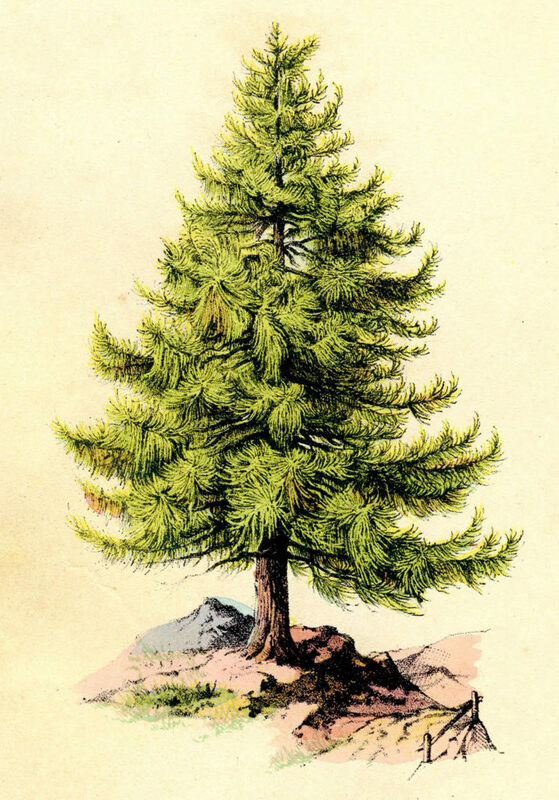 First up is this Amazing Vintage Pine Fir Tree Image! 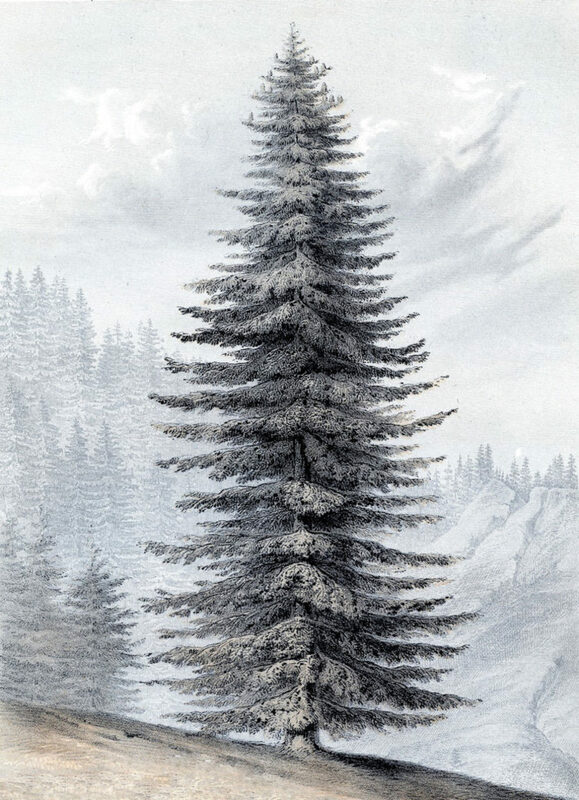 I’ve created a full size Christmas Tree Printable from a gorgeous 1870’s French Botanical Print. 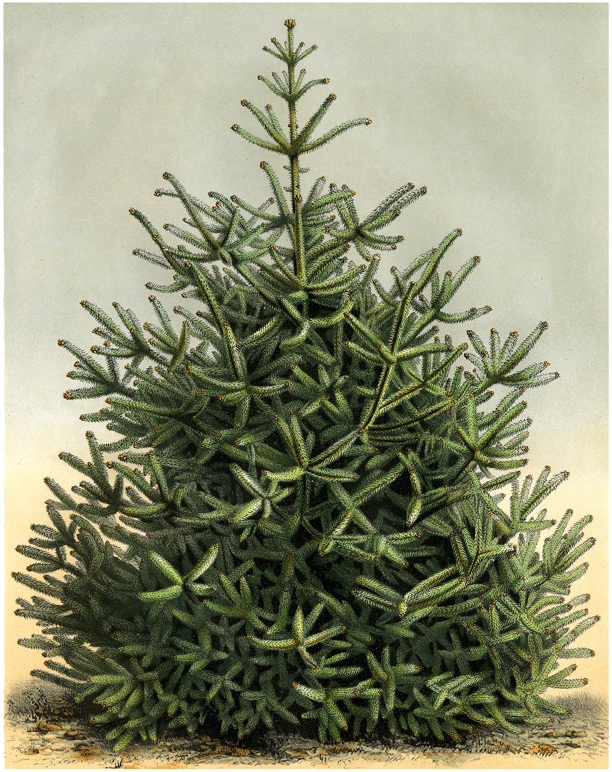 This one is some type of Evergreen, maybe it’s a Fir Tree. It looks to be quite a large tree, with beautiful bright green branches. I originally posted this one last January, right after Christmas, so I’m willing to bet a lot of you may have forgotten about this one, as you probably wouldn’t have been looking for it at the time. Wouldn’t it be fun to add some glitter and use this on a Handmade Christmas Card?! I’ve created two versions of this Glorious Giant Christmas Tree! This original is at the bottom. This first one has a few more gray tones to it and does not have the people in it or the original border. I thought this version would be great for Handmade Cards as well! This is the original version of this wonderful Antique Botanical Print of this Gigantic Glorious Pine Tree! When you see the people in the picture, you really get a sense of how large it actually is. I’m calling it a Christmas Tree and I think it would be so fun to add Glitter, Snow, some Ornaments etc. to it!! Available on the link above is a large High Resolution Instant Art Printable, that you can print out and frame. I hope you enjoy this rare find!! 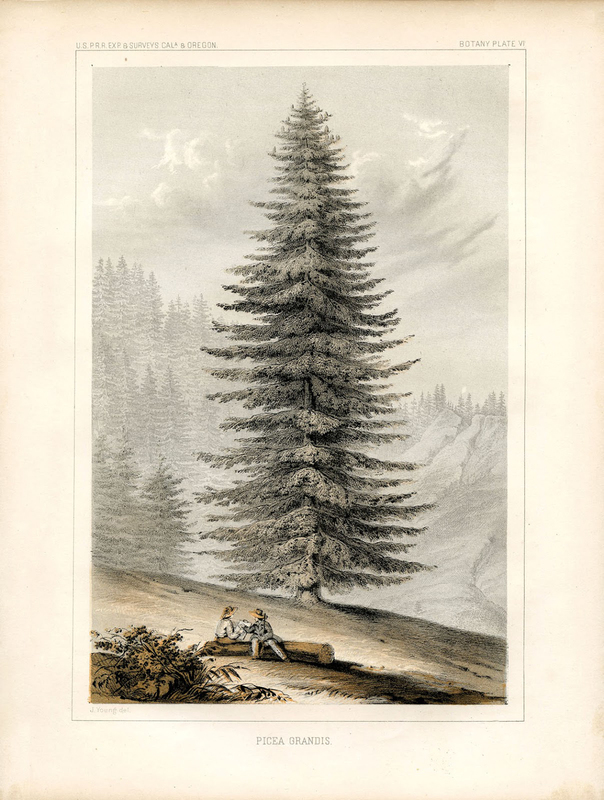 And lastly we have this beautiful Christmas tree that is from an 1875 encyclopedia. It looks like a Pine Tree to me. This is the original version with it’s creamy paper background. I’ve also included one with a white background, to give you more options for your projects. This is a nice one for collage or mixed media, and would work well for Christmas crafts too I think! I hope you enjoyed this collection of 3 Christmas Tree Printables! You might also like our collection of Best Vintage Christmas Images HERE. Thanks for sharing this beautiful tree!! I agree, it is going to be lovely on a Christmas card!!! Awesome tree – thanks so much Karen. What a great tree….and on the same day the National Christmas Tree is being set up…..thanks so much, Karen…. OMG! You’ve come up with two absolutely fantastic images today! You’re the best. Thanks, that is a gorgeous Christmas tree and I will be using it on my Christmas cards/ You are great! I’m really glad that so many of you can use this beautiful tree! Hello Karen! Love your blog of course like everyone else! You are like a public service org! I am putting your button on our home page. Thank you! Love this site!!! Beautiful images!!! Thank you so much!!! Thanks so much Tanaria, it is my pleasure and I am happy you like them! Wonderful as always! Thank you for providing this service to artists and crafters. Thanks Bev, so glad you like them!